We were just honored by the presence of MaShiAat Oloya sharing her wisdom and magic with Nut & Mawu. It was a beautifully powerful evening. This evening was a powerful lead-in to Lammas and Rhiannon. Rhiannon, also known as Rigatonia, is a Welsh Goddess of exquisite beauty. Her name means Great Queen. 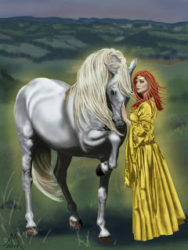 Riding Her white horse thru the night, Her gold embroidered white dress glowing and sparkling in the Moonlight, She travels across the lands. She is the Queen of the Fairies and is said to live on the island of the dead where the souls reside. There She is connected to 3 magical birds that is said when they sing can “wake the dead and lull the living to sleep.” Rhiannon is also a Queen in the Human world when She married Her husband Prince Prywl, and so is a Goddess of transformation, fertility, wisdom and magic, She is known for granting the wishes of those who are willing to ask for what they want, with no interest to those who won’t. Lammas is the beginning of the harvest season and is the first of the three pagan harvest festivals. Although it is still very warm the Sun’s strength and light begins to wane. Technically is it is the first day of Autumn. It is the first grains of the year and so the name Lammas means loaf-mass and has traditionally be celebrated by offering some of the grains in thanks, and the breaking of the first bread in celebration of the harvest and family/community. Come and celebrate with us as we ride with Rhiannon into our harvest season. For the altar please bring a white candle, any images of Rhiannon or Her symbols: the Moon, horses, songbirds, badger, dogs (especially puppies). And please bring something from the seasonal harvest in our area.